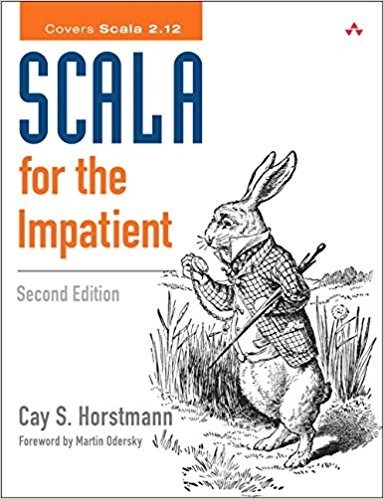 I thought I should learn a new language, and Scala seemed like a good choice so I got Scala for the Impatient by Cay S. Horstmann. Scala is a functional programming language which supports object orientation too. I’m attracted to it for a number of reasons. 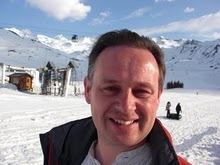 Firstly, I’m using or considering using a number of technologies which are based on Java – such as Elasticsearch, Neo4j and Spark. Although there are bindings to my favoured language, Python, for Spark in particular I feel a second class citizen. Scala, running as it does on the Java Virtual Machine, allows you to import Java functions easily and so gives better access to these systems. I’m also attracted to Scala because it is rather less verbose than Java. It feels like some of the core aspects of the language ecosystem (like the dependency manager and testing frameworks) have matured rapidly although the range of available libraries is smaller than that of older languages. Scala for the Impatient gets on with providing details of the language without much preamble. Its working assumption is that you’re somewhat familiar with Java and so concepts are explained relative to Java. I felt like it also made an assumption that you knew about the broad features of the language, since it made some use of forward referencing – where features are used in an example before being explained somewhat later in the book. I must admit programming in Scala is a bit of a culture shock after Python. Partly because its compiled rather than interpreted, although the environment does what it can to elide this difference – Scala has an REPL (read-evaluate-print-loop) which works in the background by doing a quick compile. This allows you to play around with the language very easily. The second difference is static typing – Scala is a friendly statically typed language in the sense that if you initialise something with a string value then it doesn’t force you to tell it you want this to be a string. But everything does have a very definite type. It follows the modern hipster style of putting the type after the symbol name (i.e var somevariablename: Int = 5 ), as in Go rather than before, as in earlier languages (i.e int somevariablename = 5). You have to declare new variables as either var or val. Variables (var) are mutable and values (val) are immutable. It strikes me that static typing and this feature should fix half of my programming errors which in a dynamically typed language are usually mis-spelling variable names, changing something as a side effect and putting the wrong type of thing into a variable – usually during I/O. The book starts with chapters on basic control structures and data types, to classes and objects and collection data types. There are odd chapters on file handling and regular expressions, and also on XML processing which is built into the language, although it does not implement the popular xpath query language for XML. There is also a chapter on the parsing of formal grammars. I found the chapter on futures and promises fascinating, these are relatively new ways to handle concurrency and parallelism which I hadn’t been exposed to before, I notice they have recently been introduced to Python. Chapters on type parameters, advanced types and implicit types had me mostly confused although the early parts were straightforward enough. I’d heard of templating classes and data strctures but as someone programming mainly in a dynamically typed languages I hadn’t any call for them. I turns out templating is a whole lot more complicated than I realised! My favourite chapter was the one on collections – perhaps because I’m a data scientists, and collections are where I put my data. Scala has a rich collection of collections and methods operating on collections. It avoids the abomination of the Python “dictionary” whose members are not ordered, as you might expect. Scala calls such a data structure a HashMap. It remains to be seen whether reading, once again, chapters on object-oriented programming will result in me writing object-oriented programs. It hasn’t done in the past. Scala for the Impatient doesn’t really cover the mechanics of installing Scala on your system or the development environment you might use but then such information tends to go stale fast and depends on platform. I will likely write a post on this, since installing Scala and its build tool, sbt, behind a corporate proxy was a small adventure. Googling for further help I found myself at the Scala Cookbook by Alvin Alexander quite frequently. The definitive reference book for Scala is Programming in Scala by Martin Odersky, Lex Spoon and Bill Venners. Resorting to my now familiar technique of searching the acknowledgements for women working in the area, I found Susan Potter whose website is here. Scala for the Impatient is well-named, it whistles through the language at a brisk pace, assuming you know how to program. It highlights the differences with Java, and provides you with the vocabulary to find out more.